If you want something special for you to wear, you have to put your creativity and also your skills to work. Make an unique and original scarf for you. A very cheap, easy and also quick to make DIY idea. Let’s grab all the materials needed and start creating a beautiful and unique DIY no-sew T-Shirt scarf. t-shirt – the larger and wider the t-shirt, the longer and chunkier your scarf will be. decoration elements: leather, ribbon, broken jewelry, buttons, beads, etc. get creative! cut your t-shirt from armpit to armpit lengthwise and dispose of the top part of your t-shirt (the part with the sleeves). take your tube (the body part of the t-shirt) and cut the bottom hem off so you’re left with a tube that has two un-hemmed edges. cut 3/4″ to 1″ wide strips from one looped end to the other, leaving around 1″ uncut at the top – watch the video for this step to see the visual. once you have all your strips cut pull on each length to stretch them out and get them to curl. gather all of your strips together at the un-cut section so you have them all together in a loop – it should look like a looped scarf at this point. 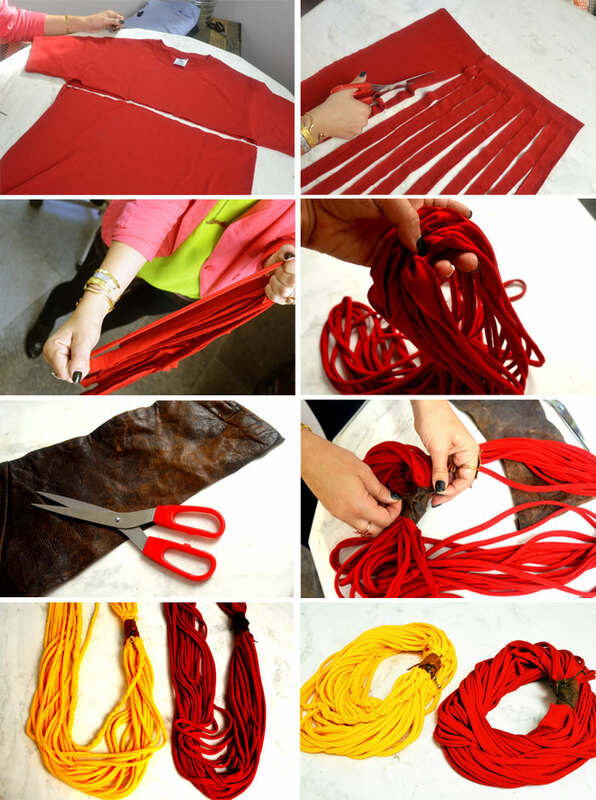 cover up your uncut section using whatever you want: a piece of leather, ribbon, another piece of t-shirt, etc. add some snazz to your leather or ribbon by hot-gluing on some jewelry, beads, chain, buttons, etc.